One major question looms after the repair of a ruptured water main in Richardson: Who pays for the damage? RICHARDSON, Texas – On Labor Day, the massive water line rupture on Crystal Mountain Drive in Richardson that flooded as many as 21 homes last week was declared patched and repaired. But the remaining repairs for homeowners, and who pays for them, is still far from settled. Workers removed a 24-foot section of the concrete and steel-reinforced water transmission line that serves Richardson, Garland, Murphy, Plano, Sachse and Wylie. It ruptured last Thursday, sending a raging torrent – in some places three feet deep – through several homes. "It's good pipe. It's got lots of life left in it," North Texas Municipal Water District Executive Director Tom Kula said of the water main installed in 1981. The subdivision of half-million dollar homes was built above it in 1999. "So this was absolutely a surprise to all of us that it did happen." The section removed will be tested to help determine the cause of the rupture. Over the next three days, work crews are expected to refill the massive hole in the middle of Crystal Mountain Drive and begin repaving the street. And as the work continues, Kula has been visiting each of the homeowners affected by the flood and the subsequent repair effort. 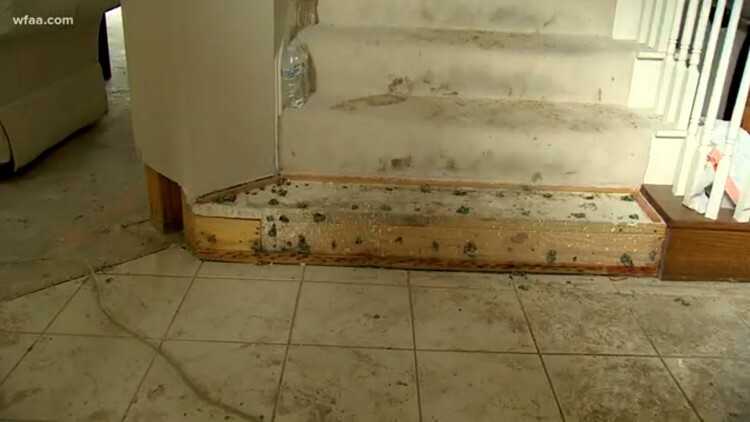 Homeowners are being told to submit property damage claims first to their own home insurance company. They are also being provided contact information for the NTMWD insurance administrator. Responsibility and liability for an incident like this and damage to private property by a public utility is not clear-cut. The NTMWD has sent a letter to impacted residents offering to reimburse them for "temporary displacement costs" like hotels, food and transportation. The district said in a Tuesday statement that it was processing those payments as receipts are sent to them. Homeowner Sylvester Lee, whose home was closest to the rupture and the recipient of three feet of water racing through his home, is finding that out already. The sudden flood damaged everything on the first floor of his home, including both cars in his garage. In a preliminary response from his homeowner's insurance company he has been told that he is not covered for a "surface water" flood. "We just don't know now. This is a one-off in a sense. So we'll just have to see what happens," he said, remaining hopeful that his insurance company and the NTMWD insurer will be able to reach a reasonable decision. "We'll just have to keep at it. And hopefully things start to fall in place in the days to come." "What we're trying to do is make this happen as quickly as possible so they can get an idea as soon as possible what kind of relief that they're going to be able to get," said Kula. "Those that I've talked to, I've assured them the insurer for the district is going to follow up with them, listen to what their claim is, and then it's going to take a number of days to sort through exactly how this is going to be handled. It's way too early but it's a process and we want to make sure that the process gets going." A forensic investigation into the cause of the rupture is expected to take several weeks. Meanwhile, water district employees, now on a first-name basis with the residents of this neighborhood, are helping remove waterlogged debris piled up outside damaged homes and placing it in dumpsters for removal at the water district's expense. Sylvester Lee is thankful for that. He's just hoping an answer on insurance coverage will arrive just as quickly.